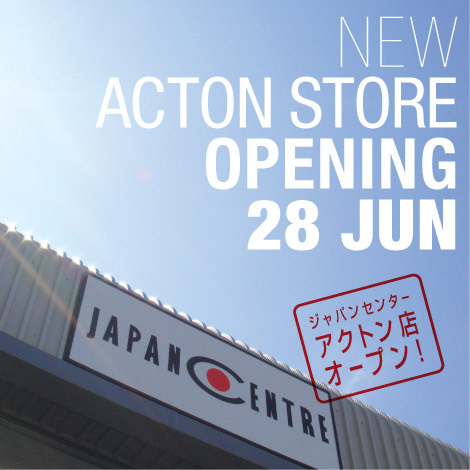 A new large Japan Centre store is opening Monday 28th June 2010 in Acton. There’ll be all the usual great Japanese food items available as well as fresh vegetables, Japanese bakery, quality sake, Daiso homeware and our Online Collection service. It is just 3 minutes walk from North Acton station and has space for 30 car parking spaces outside. Check our website for more information and a map. WHAT’S ON OFFER AT OUR ACTON STORE? Our new food store offers a great range of authentic Japanese food and drinks, as well as the best selection of sake in London. There’ll also be lots of fresh Japanese vegetables and bakery items such as Curry Pan and Melon Pan to buy, baked every day on the premises. We also have a range of Japanese homeware, bento and craft items available! Japanese magazine and book range coming soon! Visit us to get an application form for Gold Card Membership or contact us and get the application form on Email. At the entrance to Victoria Industrial Estate push the “Call” button at the barriers and then say ‘Japan Centre’. Please come and park outside the area dedicated to Japan Centre. We look forward to seeing you all here soon! Best Wishes to all with the New Store. Thank you for heartful mail. I worried about your father. I’m so sorry that i couldn’t going to Ireland. Visited the new shop today – absolutely excellent. Thanks! Could you give us more information about the membership? Is this for trade only? Do you have to pay anything to be a member? Regards, Paul. The reason we require a membership to shop at the Acton store is due to regulations of the warehouse industrial estate where it is located. In order to become a member, you simply need to fill in a quick form and pay £1 to receive a membership card. If you decide that you no longer wish to shop at Japan Centre in Acton, you can cancel the membership and get a refund for the £1 fee. I hope this helps and thanks. Please can you tell me more about the requirements for shopping in the Acton Store? I came once after it first opened but was not able to purchase anything and was told it is for trade only, has this changed?